Hey, Merry Wynter here. I've been thinking about this a lot lately; sometimes you make friends in the most unexpected ways! Isn't that true? Here's what made me think of that today; for a very special wedding at Wynter Castle, one of my gifts to the bride is going to be her wedding favors. Weddings can get expensive, and they don't want to spend a lot. The venue is my castle in upstate New York, so that's free, but there are always more expenses than you think there are going to be. I remember my wedding ten years ago... but that's another story, one that ended in tragedy, as some of you know. Anyway... I was talking to my friend Gogi Grace, and when I asked her what she thought I should do for wedding favors she mentioned unique heart shaped teacups, with tea that was blended specially for the bride and groom. 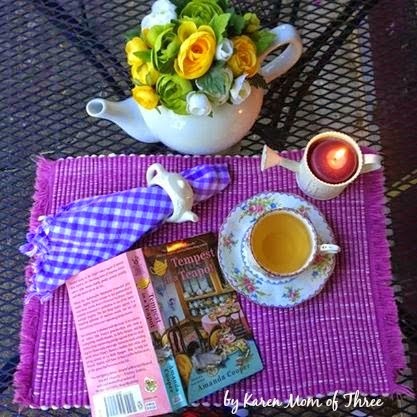 She and some girlfriends had gone on a day trip to a town called Gracious Grove, not too far from here near the Finger Lakes, and came away with the tearoom's own blend of tea, done up in cute packages with the tearoom's name - Auntie Rose's Victorian Tea House - on the packaging. Maybe I could have the same thing done with the bride and groom's names and date of the wedding on it. What a great idea! Anyway, I got the phone number and made a call to the tearoom to find out who their tea source was, and had an interesting conversation with a young woman working there who is also 'Auntie Rose's' granddaughter, Sophie Taylor. After we talked about her tearoom, the tea, and a lot of other things, we discovered that we had both recently been too close to a murder and had to do a little investigating on our own. We had other things in common, too. We've both most recently lived in New York. And we both have a man in our lives that we just can't figure out. In her case it is an old flame, a teenage love who she hurt many years ago. Now she can't figure out how he feels about her. She's afraid to dig too deep in case he wants nothing more to do with her beyond friendship, tho' her feelings have reawakened. I explained about the handsome Sheriff Virgil Grace, and my own confusion over whether I was ready for a new love when I still feel like I'm in love with my late husband, Miguel. "So what are you going to do, Merry?" Sophie asked. "How do you handle it when you're just not sure?" I wished I had a solid answer for her. "I guess I'm going to go forward with caution. At least in your case you know he once felt deeply for you. With Virgil I just don't know how he feels." "It's worse, in a way, for me," Sophie said. "We had something special and I hurt him. He might be so far over me there's nothing left." Thanks to Karen Owen for the lovely photo! "Aren't we a couple of sad sisters," I said, with a laugh. "I think you should just talk to him, acknowledge what you did, explain how young and confused you were, and ask if there's any hope." "Easy for you to say! I think you should confront Virgil, tell him you know there is something between you, and ask him out for coffee." "Or tea?" I asked. We both laughed. "And then there is the whole murder investigation thing," I added. "He thinks I'm a bit interfering." "Sounds like you and I are cut from the same cloth, as my Nana would say," Sophie said. "Let's talk again in a few months and find out what we've done about our love lives. That's barring any more trouble like murders happening." "That's not likely to happen again," I said. "Autumn Vale is a small town! Yet another murder would just be too big a coincidence." "Gracious Grove is smallish, too. You're right. It's not going to happen again, so we can get on with business and our love lives." And that's where we left it. She's going to try to figure out how Jason Murphy feels about her after a dozen years apart, and I've promised I'm going to tackle Virgil Grace... perhaps quite literally. He makes my cheeks get warm and my heart beat faster. I'm nervous, though. I'm not used to making the first move. Any ladies out there who made the first move on the man they loved? How'd it turn out? And gentlemen... did a lady ever tell you outright how she felt? Did you like it? I'm just not sure how to go about it, and would appreciate any suggestions you may have. Calling all cozy mystery readers!! It is the Cozy Days of Summer Killer Characters giveaway!! And I have a SUPER prize package for you! Comment before midnight to enter to win a super package that includes Tempest in a Teapot, Muffin But Murder, AND Bran New Death, book 1 of the Merry Muffin Mysteries! 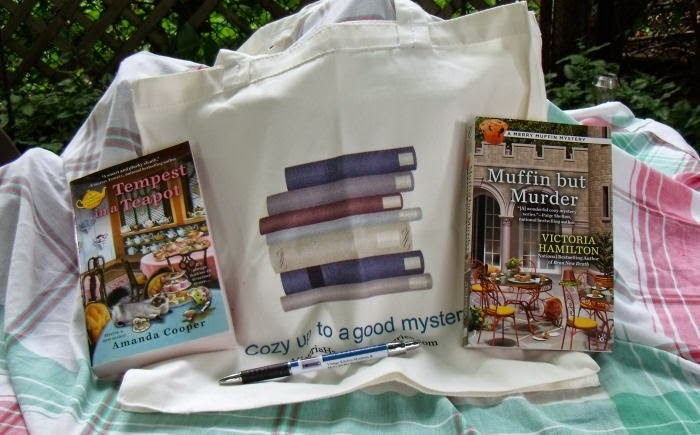 You'll get one Cozy Up to a Good Mystery book tote, a pen, and a handcrafted bookmark in every package, a little bonus!! Please Note: for the purpose of today's drawing ONLY, entries can come from both the US and Canada! Check out Victoria Hamilton - aka Amanda Cooper - online! To learn about new releases and contests, sign up for Victoria's newsletter using the subscription form on her website! Just scroll down to the bottom and look on the right hand side to sign up! Great post. I love tea and would love to visit that tea room. I asked my husband out for our first date. We have been married 22 years so it worked out just fine. I have no suggestions for you. I'm just glad this contest is open to Canada. :-) I enjoyed "Bran New Death" and am looking forward to reading more of your books. Oh my, two of my favorite characters getting together for a chat. I love this post! What a wonderful idea! The book sounds really good, love the cover! My husband and I were pen pals while he was deployed for Desert Storm. I say that I asked him out first and he says he asked me out. What I really think happened is that our letters asking the other one passed each other in the mail. :) We've been together ever since then. Love the muffin series and the tea shop series is on my TBR list. I agree with someone else who said a crossover book would fun. My husband and I met through mutual friends at a wedding. Turned out that we have a lot of mutual friends, so we double dated a lot. I wish I had a suggestion for you, but I don't. Love the book crossover!! A great post. I love that one of Karen Owen's photos was used! She uses them on her blog and they are always so beautifully done! 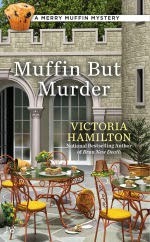 I love all of Victoria Hamilton's books. And that of course includes Amanada Cooper. Wow! Now that is some kind of prize package. Thank you for offering these great books. Good luck to everyone. That's a great bundle of prizes. I'm keeping my fingers crossed because I want to read these books. They are right down my alley! Great Books, waiting for the next ones to come out. Thanks for the chance to enter in the contest. Oooh, what a great list of goodies. I hope I win. Would love to read these!! What a great giveaway! Love the books offered. As for the dating suggestions, my husband asked me out first and I refused. Months later after some thought, I asked him out and we've been married over 16 years. Worked out well in the end! The man I was interested in happened to be my friend's good friend. When I met him I let my friend know that I liked him and he relayed the message. Well, he felt the same about me. What was the result? We're married 20 years in September!! Life's too short to let a good thing pass you by. If you are interested in someone you should find a tactful way to let the person know. And, I LOVE the heart shaped teacup. I wish I'd thought of that for my own wedding favors. Thanks for giveaway. Love cozy mystery . I was the first to tell my husband I loved him... but I waited for him to ask me to marry him. ;-) We've been happily married for almost 24 years. The heart-shaped teacup is precious - where on earth did you find it? And the conversation between your two heroines is delightful - as are both characters. I agree with an early comment: a crossover mystery could be a lot of fun. I say do what feels right for you. I haven't read any of these books but Bran New Death has been on my to read list For a while. What an amazing opportunity. I love Krista Davis' s books and haven't read either one of the giveaway books! Thank you so much for the chance! Would love to win. The books all look wonderful! I want that heart-shaped teacup! I claim that I made the first move because I invited him to my 13th birthday party and he claims he made the first move because he invited me to go bike riding the next morning (hey, we were young!). Whichever, it worked. We had kind of a force field around each other in high school - the young, possessive mine, mine, mine. Kind of morphed into a more adult mine. We just celebrated our 45th anniversary in June. 3 children, 5 grandchildren, 3 great-grandchildren with 2 more on the way. What a great prize package. Thanks for the opportunity to win. I would cook him a fabulous meal. They say the way to a man's heart is through his stomach. I made the first move and my husband and I just celebrated our 33rd anniversary together earlier this month. Love the teacup. Would be great win and can't wait to read. I say...Just bite the bullet and say how you feel. I am a huge fan of Merry! So looking forward to reading her next adventure. Clearly judging from the conversation, Tempest in a Teapot is next! Would love to win the goodies!! BTW, huge fan of the Vintage Kitchen series. 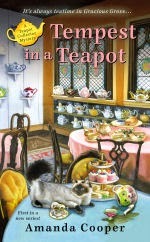 I love the muffin series and I know I will also love the teapot series! Thank you! I love cozies! Looking forward to the new publications! Wow, what a great cozy giveaway - count me in! I enjoyed the conversation and ideas for bridal favors - especially the heart shaped teacups and a special blend to reflect the relationship of the bride and groom. What a unique idea! This is a wonderful giveaway. Good luck to everyone and congratulations to the eventual winner! I'm loving the Vintage Kitchen series and both the Merry Muffin series and the Teapot Collector series are pretty high on my TBR list. I have a feeling I'll be loving them as much as Vintage Kitchen. Thanks for doing this awesome giveaway. What a out standing give away, thank you. Thanks for the giveaway! I love tea and muffins so these books are right up my alley! I asked my sweetheart out on our first date. It was an overwhelming success! wow what an awesome give away anyone would be very lucky to win any of these books. This is a FABULOUS new series--can't recommend this enough! Love the tea cup shape. Great giveaway. Thanks for sharing your talent. I'd love to win. Well, hubby and I met at work, he initially asked me out but was a slow mover so I usually did the calling and asking out, after about 6 months I gave the ultimatum that he either step up and take a little more initiative or take a hike and here we are 26 years later...yes, he stepped it up, LOL. I have never been in that position, but I have observed friends pushing. Sounds like a great stack of books! I miss Google Reader where I'd receive notice from all of you wonderful authors and your websites!!! So many of these books looks awesome! Maybe I'm no one to ask.I tried to make a first move on one fellow who immediately gave me a lecture on bacon; he had just gotten a job as a bacon inspector...that was almost the most interesting except...I did tell my one male friend that we were under mistletoe. (we actually were), and that landed me the kiss of a lifetime. He's the one I married...after a couple of separations of feelings and geography.It was a long road but we are nearing our 32nd wedding anniversary. I don't drink tea, but recently attended a baby shower with an Alice in Wonderland theme. They had wonderful decorations, including lining the center of the long tables with teapots. My sister and her 3 1/2 year old granddaughter had a wonderful time pretending to drink tea! This looks so awesome!! Oh, please be mine!! Should I win this prize package, I would certainly share those 2 books with my daughter &/or a reading friend -- I'm not willing to loan them my original copies ye ( lol ). And I would love to read TEMPEST IN A TEAPOT. These daily posts and contests are fun! Thank you for doing them. I've made the first move a few times. None of them worked. Of course, waiting for him to make the first move hasn't worked for me either, as I'm still single. So...good luck! I would love to win this as my Birthday present, which is today! I made the first move with my hubby----he was so shy that he never would have done it. I'm not used to making the first move but some times I think you might have to. Guys might need the push. I remember the first and only time I asked a guy out. I got tried of wait for him to make the move. Wow, would love to win this prize package!!! I met my husband when we worked at the same bank. There's an 11 year difference between us & he thought I was too young for him, so I had to do the pursuing. I didn't drive & he went in the general direction of my house, so I was constantly asking him for a ride home. Then I got the idea (from my Mother) to send him a funny valentine. Anyway, he finally asked me out in April or May & got married in November of that same year! We've been married 43 years! 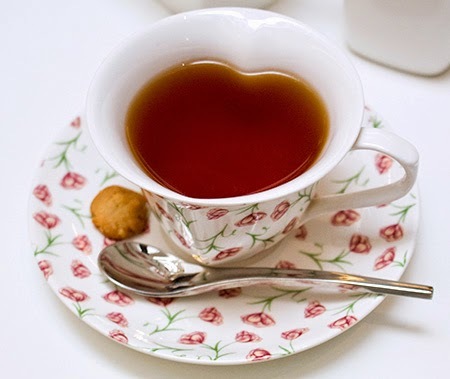 now i want a heart shaped teacup! I love this Article. Please enter me. Sorry, I haven't any suggestions. I managed to turn a comment into a marriage proposal. My husband is probably still wondering what he said. I was and am way too shy to make the first move. I'm very old school when it comes to making the first move...I believe a guy should ask a girl out not the other way around. Sounds sexist, but it's not, just old fashioned. Thanks for the great giveaway. I'm a huge tea drinker and look forward to reading your tea series and the other ones. Oh I would love to win. Tea and cozies and muffins make me happy. :) And I'm old fashioned~I'd be too scared to make the first move. I made the first move with my husband and it turned out great!!! I would love to win your books!!! Great giveaway. Looking forward to reading it. I love tea and I love to read. Awesome giveaway! Thanks for the win! Can't wait to get my package!